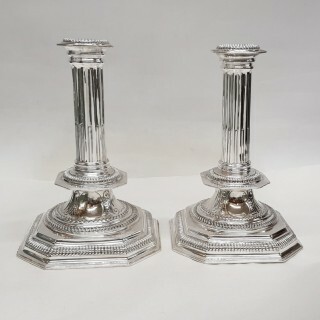 A pair of antique silver candlesticks in the style of the reign of William III. 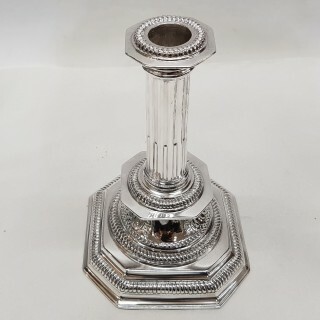 Britannia standard silver* 95.8 pure. 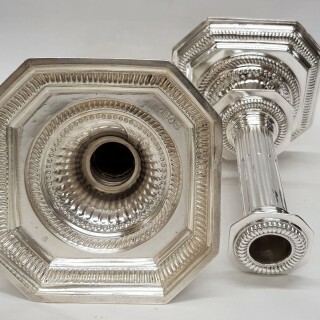 These fine candlesticks stand on square canted corner bases with reed columns and multiple gadroon borders. Fixed circular candle sconces. To the front of the base there is a fish scale cartouche (uninscribed). Weight 1033 grams, 33.2 troy ounces. Height 21.5cm approx. Base 14.7cm. London 1876. Maker Charles Stuart Harris. 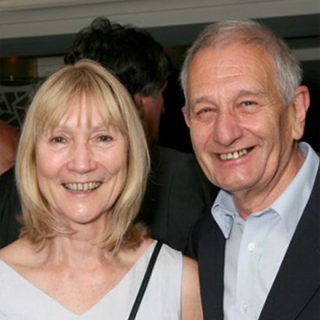 Biography – Charles Stuart Harris. 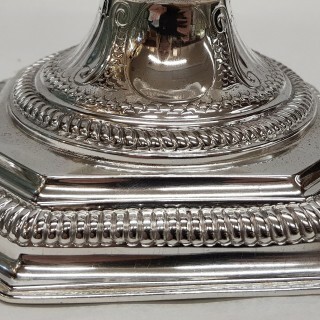 This large manufacturing silversmiths, C.S. Harris & Sons Ltd, was started by John Mark Harris, spoon maker in 1817 and continued by John Robert Harris, probably J.M. Harris’s son from 1843 until 1852 as a silver spoon and fork manufacturer. In c.1852 the business passed to Charles Stuart Harris, electro spoon and fork maker and manufacturer of plated wares and silversmith. In 1885 he purchased the business of D.J. 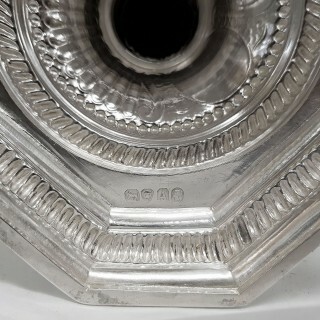 & C. Houle, manufacturing silversmiths. In 1897 the business became a limited company C.S. Harris and Sons Ltd and continued in business until 1933/34 when they were incorporated into I Freeman & Sons Ltd. 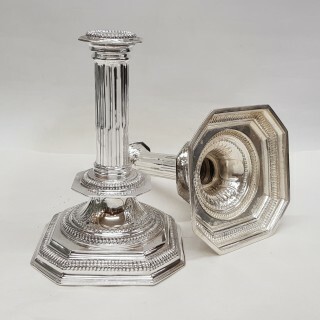 These decorative candlesticks are in very good condition with no damage or restoration. Good weight. 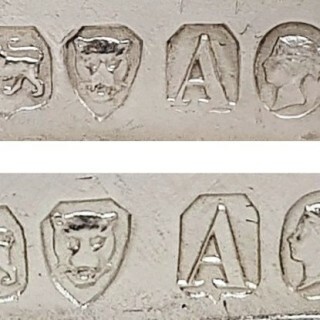 Fully stamped underneath with clear and matching English silver hallmarks.